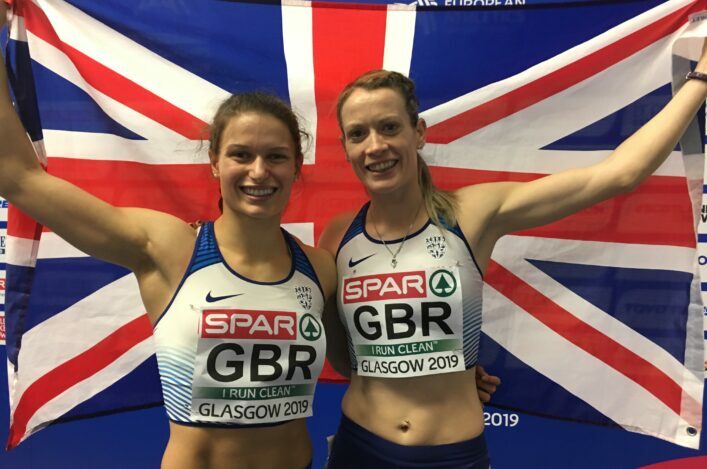 Scottish athletes strode to the podium nine times at the Spar British Champs and Euro Trials – with five savouring their coronation at UK champions. 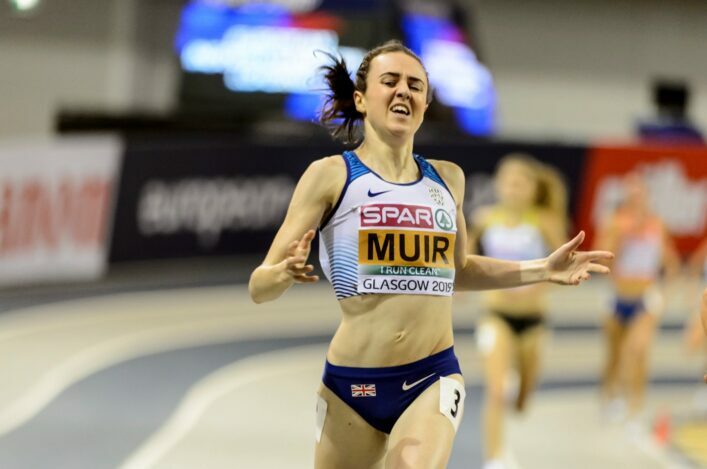 And the medal rush means that a minimum of half a dozen home Scots will be with GB and NI team for the European Indoors at Glasgow 2019. 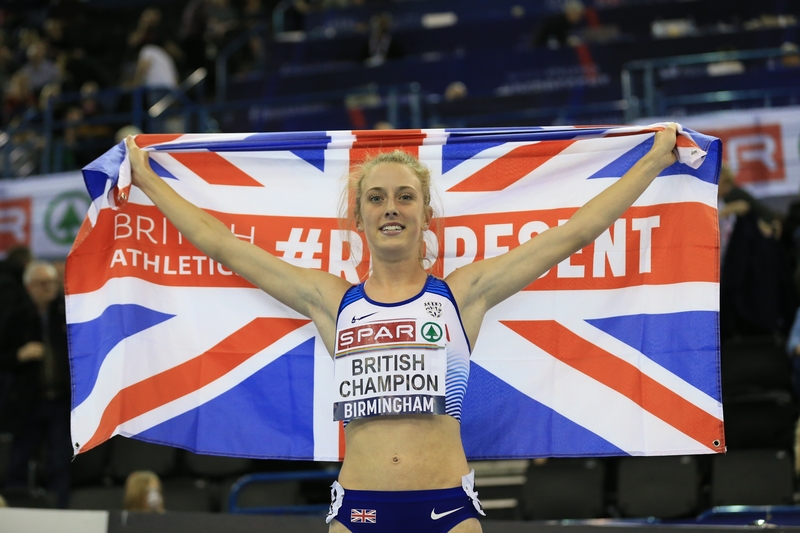 National champions Laura Muir, Neil Gourley, Zoey Clark, Chris O’Hare and Jemma Reekie are assured of selection after winning finals at Arena Birmingham. Guy Learmonth finished third in the Men’s 800m race but was elevated to silver after a DQ decision and that earns the Lasswade AC athlete an automatic place. 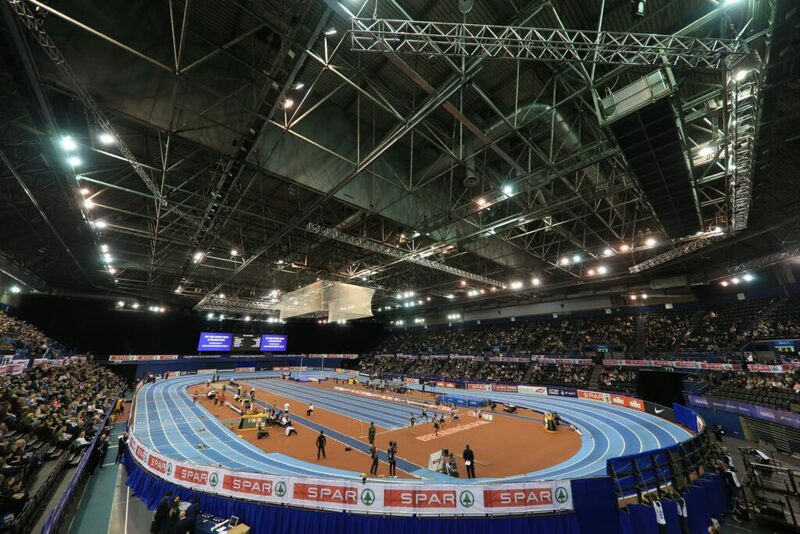 Eilidh Doyle, Andy Butchart, Lynsey Sharp and Adam Thomas all retain selection hopes with the window open until after the Birmingham Grand Prix this coming Saturday – with the team announcement for the Emirates Arena event due 24 hours later. Eilish McColgan has a chance, too, if she can prove fitness. Neil Gourley had started the medal rush just after 3.30pm in the Men’s 1500m final to book his ticket to Glasgow 2019. The Giffnock athlete timed his run superbly to overhaul Elliot Giles during the final 100m to take gold in a time of 3.44.76. Sol Sweeney put in a big effort in an exciting race and came home in fourth in 3.46.43. “I definitely want to get a few individual medals to my name and this (Euro Indoors) will be such a wonderful opportunity to start that off.” Interview with Zoey Clark after her UK 400m title win, booking her place for the event on home soil in Glasgow. Next up was the Women’s 400m final – with Zoey Clark making sure of her place at the Emirates Arena. Laviai Nielsen was still leading almost into the home straight but Clark over-hauled her to win in 52.85 and clinch selection. Eilidh Doyle was fourth in a tight finish with 53.06 and will have and wait and see on the selection discussions. ‘This is a Championships so it’s less about the time and more about the position,’ said Zoey. At time of writing, Learmonth ended up with a silver medal after a dramatic 800m final – which had seen Jamie Webb cross the line first on the track. Learmonth had been edged into third by Joseph Reid but a DQ ruled Webb out of the equation. 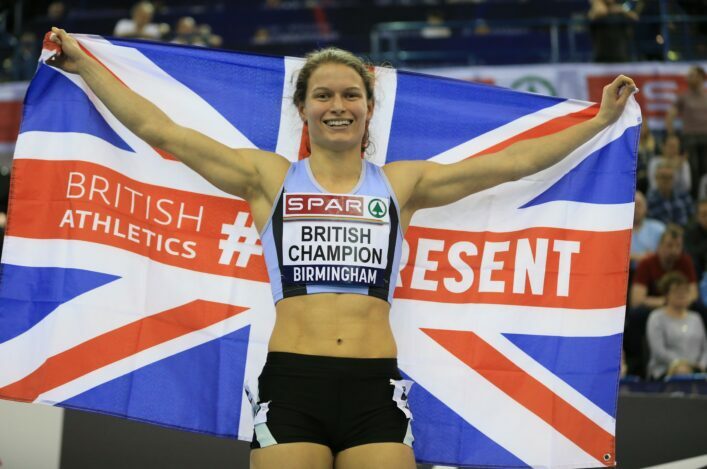 Webb immediately lodged an appeal and British Athletics took their time over the deliberations. Chris O’Hare has only just switched up to the 3000m distance but he ran a fine race tactically to see off the challenges of Andy Butchart and Charlie Grice – winning in 7.52.86. 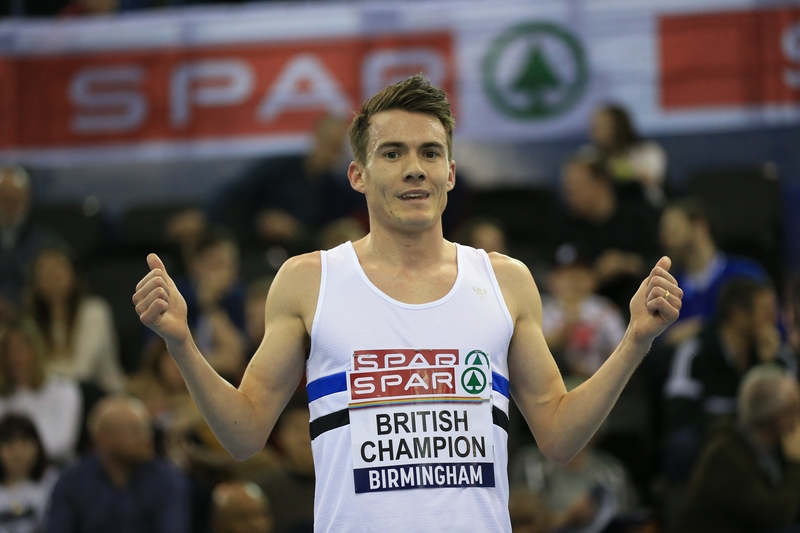 That means the Edinburgh AC athlete is in the team for Glasgow while Central AC’s Butchart, who finished third, must wait a little longer, although he has the qualifying time. ‘I feel really good but the 3000m has been a tough race and a new event for me,’ said Chris, with Adam Craig finishing 12th in that race at 8.13.27. ‘My run in Boston was my first 3000m in around six or seven years and it’s good to take it out as I did and get the win. I just made the step up purely for indoors, I’m not finished with the 1500m yet by any stretch. Lynsey Sharp has the qualifying time for Glasgow but is now sweating on the selection argument after fading into fifth place in the Women’s 800m final with 2.06.23, won by Shelayna Oskan-Clark. In the women’s 1500m final, which concluded the event, Reekie surged clear late in the race and produced a devastating kick to win in fine style – after biding her time early on. Jemma clocked 4.17 .08 and there was a fine effort from her Kilbarchan AAC team-mate, Kerry Macangus, with the 19-year-old leading out the race for a long time and being rewarded with a PB at 4.20.25 . . . and an excellent fourth place at 19. ‘I’ve missed racing and it’s so exciting to get back out and race,’ said Jemma. ‘I knew the competition was going to be hard and I was going to have to work and I really wanted to make sure I was at the Europeans. Nikki Manson was a bronze medallist in the Women’s high jump with a clearance of 1.80m, as Morgan Lake took gold at 1.93m. Emma Nuttall also cleared 1.80m to finish fourth. In the men’s long jump, there was a fifth place for Scottish champion, Alessandro Schenini. The Giffnock North athlete reached 7.40m with Paul Ogun in sixth place with 7.37 and Stephen Mackenze in eighth place with 7.27m. Sprinter Fraser Angus, another Giffnock athlete, reached the 200m final with a PB run of 21.54 to come through the initial heats and then third place in his semi. Fraser was sixth in the final. Stacey Downie raced in the 200m heats. 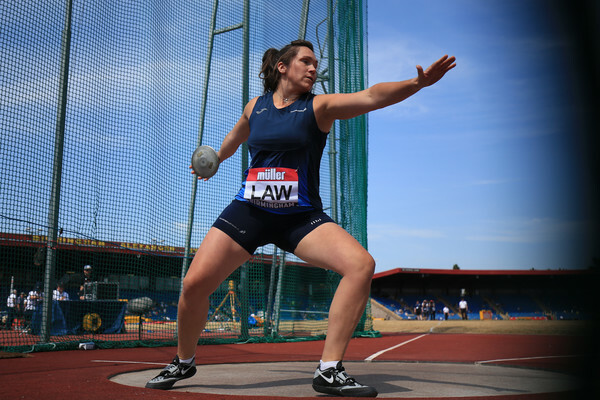 Edinburgh AC athlete Sarah Warnock was eighth in the long jump with 6.12m.